A speeding driver who was not wearing his glasses when he hit a mother and her son on a pedestrian crossing has been jailed for more than five years. Shantelle Kirkup died after being struck on St Cuthbert's Way, Darlington, in May last year. Her "last act of care" was to propel her six-year-old son out of the path of Stuart Levy. Levy, 37, admitted causing death by dangerous driving and causing serious injury by dangerous driving. 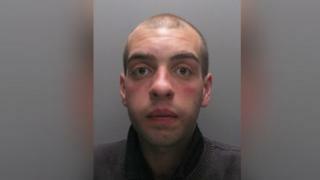 He displayed an "utterly dangerous and cavalier attitude", Teesside Crown Court heard. Levy had been out to collect his methadone prescription and had drunk his daily dose before the crash. Having undertaken another vehicle as he approached the crossing, his Ford Focus hit 29-year-old Mrs Kirkup as she held the hand of her son, Jaxon. Her new husband, James, had been pushing their two-year-old daughter, Jemima, in a buggy and had crossed the road ahead of them. Mr Kirkup had taken his son to a dinosaur show while his wife had been buying birthday presents with Jemima before the family bought ice creams. The traffic lights were on amber as they crossed but Levy failed to react until it was too late. It was estimated he was travelling at 34 to 41mph (54 to 66km/h) on the 30mph (48km/h) road when he hit the pair. Richard Bennett, prosecuting, said: "Shantelle had hold of Jaxon's hand for his safety, that last act of care helped propel Jaxon out of the path of the vehicle thereby probably saving his life." The youngster suffered a broken leg. Levy, of Rocket Street, Darlington, told police he had been wearing his glasses and said the Kirkups had run out when the lights were on green. Those claims were shown to be lies - Levy's spectacles were broken and found later at his ex-partner's home. He knew he needed to wear them having suffered an almost 50% loss of his "visual field" in his left eye following a brain haemorrhage. Simon Perkins, defending, said Levy "recognises the dreadful wrong he has brought on this family". Judge Simon Bourne-Arton QC, said: "You knew full well you shouldn't be driving without glasses. You chose to ignore that. Levy was jailed for five years and four months, and banned from driving for eight years.